This blog is written by Jordan Denari Duffner originally in OSVNEWS.com. This entry was posted in Blog and tagged catholic, interfaith, muslim, Pope Francis on March 1, 2019 by commonword. In the last ten years I have attended Dialogue events in Canada and the USA. The usual format has been speakers being given equal time and then a Q & A for the audience to engage the speakers. Here in Edmonton we decided instead to make it a priority that the participants engage with each other and have therefore designated the time allotments accordingly. The Speakers are there to shape the theme of the event and to be a catalyst for the discussion. We certainly hope that people leave the event pleased with the speakers and how they were challenged. But even more we as a committee long to hear from participants that they had a positive time around the tables in the facilitated discussion period. We try, but don’t always accomplish two blocks of time, each 45 minutes in length. As to opening ceremonies, we always start by a prayer or recitation of one faith community, and close the event with the other. The first is usually the host community. The last years we have had an Indigenous person doing a welcome and opening as well. The icebreaker is done with a set of cards supplied by the Intercultural Dialogue Institute. The cards are distributed around each table and each person shares an experience in turn. The cards are topics that help us establish our common humanity before we address faith issues later in the program. Some examples would be: Describe a time that you were very afraid, tell about a favourite person as you were growing up, etc. The speakers of each community are given two rounds of 15 minutes each. The core of the Dialogue happens in the two discussion periods after the speakers. 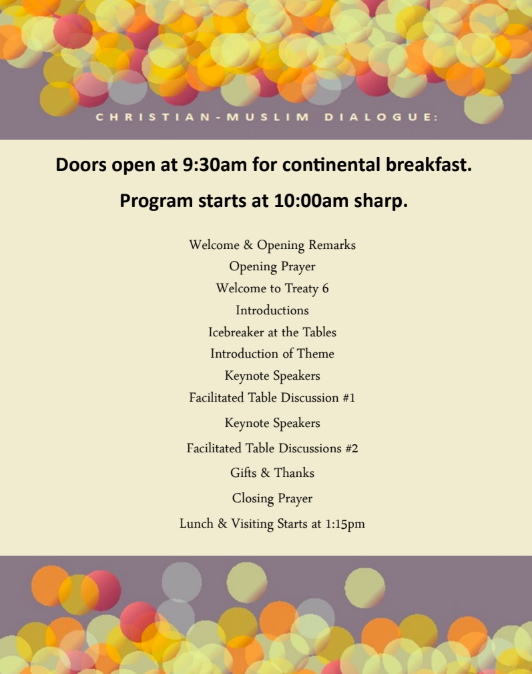 Here is an example of a typical schedule for our event, based on our 2018 dialogue event. But in summary, none of this is possible unless there is “a willingness of all faith communities to work together on a continuous basis to form a closer bond”. Let’s not lose sight of this as the beginning point for anything of good to happen through the logistics of the Dialogue event. This entry was posted in Blog and tagged christian, dialogue, interfaith, muslim on February 11, 2019 by commonword.